With Face ID 3, all you need is one look, and you’re ready to go. 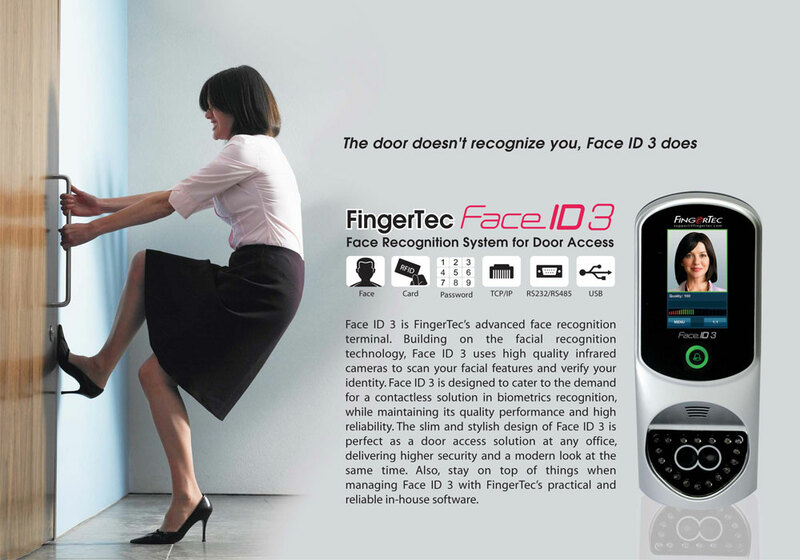 Facial recognition makes it easy for you to verify yourself without having to free your hands. connected terminals, while containing time attendance functions for attendance monitoring. Face ID 3 enrolls vivid images of the user and stores them as a large file for a more accurate face verification. Face ID 3 now has an additional feature of 50 Time Zones for you to control and organize authorized access at your workplace. Sync Face ID 3 with a PC using one of the many available connections: TCP/IP, RS232, RS485, USB flash disk or 26-bit Wiegand input-output. You have multiple verification options with Face ID 3. Verify yourself using face, card, or even by password. Full colour touch screen, short messaging, work codes, photo display after verification. These are among our many additional features that you get to enjoy with Face ID 3. VOICE / DISPLAY LANGUAGE (TERMINAL) English (Standard), Arabic, Indonesian, Chinese (Traditional), Chinese (Simplified), Cantonese, Vietnamese, Japanese, Spanish, Portuguese (Portugal), Turkish. Other languages are available upon request.